The Big Four covers an international conspiracy involving four mysterious figureheads from around the world. 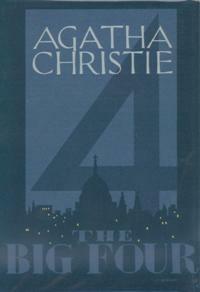 The idea of this mysterious organization called 'The Big Four' is the birth of a new world (an idea that had obsessed Agatha Christie in Passenger to Frankfurt, N or M? and other novels). The threat of unknown figures with a mania for killing off any number of people to cleanse the existing world was one that scared most people who had gone through the war. Number 1 is a man from China who constitutes the 'brains' of the group; Number 2 is an American representing the money; Number 3 is the scientific genius - a famous French female scientist; Number 4 is the 'enforcer' - a man skilled at transforming his appearance and one who gets the job done. It is this man whom Poirot fears the most. We start the novel off with Poirot deciding to embark on a journey - a journey by boat - to go to his friend Hastings and live the rest of his days in peace and quiet. But by chance, Hastings has come to London, and the aborted departure is anything but good for 'The Big Four'. Definitely not one of my favorite novels. I am not a fan of Christie's 'international conspiracies' myself more partial to the intimate and personal mysteries involving a family circle with some romance thrown in! To write a story .... you must come to terms with your background. If the background is fantastic, then the story must accept its background. It, too, must be a fantasy - an extravaganza. The setting must include the fantastic facts of daily life. It is not an impossible story - it is only a fantastic one. I found this particular novel more fantastic than enjoyable. The only point of interest was the battle of wits between Number 4 and Poirot - although there was never any doubt who would succeed! Hastings was his usual dense self.